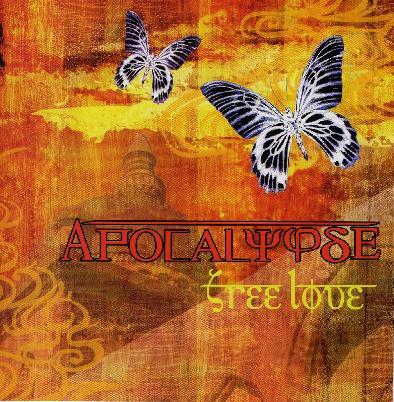 Free Love is a relatively new band from Japan that play very intense progressive psychedelic rock music. This is the bands first full length CD. One of the bands major influences is Led Zeppelin but the band throws in its own dose of psychic Japanese power. In fact, the CD begins with the bands short and very cool version of Kashmir. It is a really unique and psychedelic take on the classic Zep song. Spiral is next and this is an excellent nearly 8 minute instrumental track that really shows what good players these guys are, especially keyboard player Horoki Matsui. It starts off quite hypnotic and slowly builds as the guitar begins to solo into the developing loop like groove. Suddenly the track nearly stops and gets very spacey before it takes off again. Great number. Kami-No Chishiki is next and brings things down after 2 very intense songs. Guitarist Hiroaki sings the lead vocals in Japanese. This track comes across as something probably very special to the band and almost a bit Beatles like. Island has a really down and dirty distorted guitar riff and a great rock groove with the organ playing a major role in shaping the sound of this track. Maze of Psycho is next and 9½ minutes long. It begins with a drum solo and a jam develops that is quite spacey. As he repeats the lyrics over and over, the band eventually take off with some great guitar and organ soloing. Umi-No koe is a beautiful piece with some flute like keyboards played at the beginning. The 19 minute psychedelic rock monster, Shangrii-La, again a very Led Zeppelin-Kingston Wall influenced track, ends this CD and again really demonstrates the ability of the band. This is really cool stuff and I can't wait for them to make the next record. For more information you can visit the Free Love web site at: http://ww35.tiki.ne.jp/~apocalypse (ALL JAPANESE). Best to visit the Poseidon web site at: http://www.musicterm.jp/poseidon/index-e.html.